In this thought-provoking book Scott Gustafson argues that economics performs the same function in contemporary American culture that religions did in past cultures. He describes and analyzes the rituals, pilgrimage sites, myths, prophets, reformers, sacraments, and mission of economics to show how the economy operates as our de facto "god." Understanding how economics functions as a religion is the first step in addressing many of today's political and social problems, Gustafson says. Our inability to compromise on economic matters is much more intelligible when competing principles are understood as religious laws that cannot be violated. 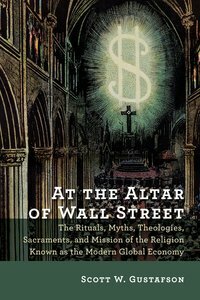 At the Altar of Wall Street encompasses a broad sweep of history, philosophy, culture studies, economic ideas -- and religion, of course -- and offers insightful discussion of such topics as debt, economic terrorism, globalization, and money as the economy's sacrament. Thoughtful readers will find plenty to chew on here. About "At the Altar of Wall Street"